A Texas abortion rights activist who became a media sensation after her forced removal from the Texas senate — in the midst of her testimony — is now turning her focus to Gov. 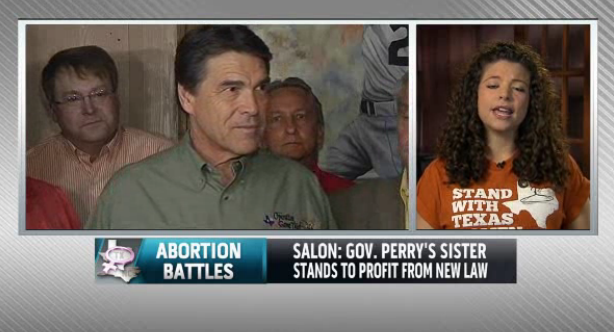 Rick Perry and his possible conflict of interest in regards to the Texas abortion bill. Appearing on MSNBC this Monday, Sarah Slamen alleged that Republicans are attempting to shoot down reports that suggest Rick Perry’s sister would benefit financially form a provision that would require all abortions to be performed in ambulatory surgical centers. Milla Perry Jones, who is the Texas governor’s sister, is vice president of government affairs for a surgical partners firm and also sits on the board of the Texas Ambulatory Surgical Society. 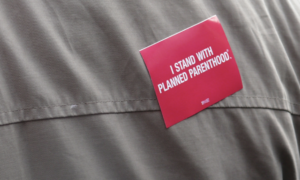 Critics claim that the new abortion laws will force women to turn to the more costly care offered by the centers — which fall under the control of the groups that Perry’s sister is connected to. “I think I will directly go towards impugning the character of the governor and his sister who would limit health care access for half the population of Texas in the guise of our health when actually it just goes to support them financially,” Slamen said. Hear Sarah Slamen’s comments at about 05:04 in the video below. If Sarah Slamen was my daughter I would be so proud! She is a Texas Teapub’s worst nightmare…a strong, well educated and independent woman! They are wetting themselves every time they see her or hear her speak! Keep it up Sarah, expose these crooks for the lowlife hypocrites that they are! So this is the second law he’s passed that financially helps his friends and family. Sounding like the one in FL that wants to test welfare recipients and state workers for drug use while owning shares in the labs that do the testing. People in power that pass laws or abuse laws for their own benefit deserve to sit in prison for the rest of their lives. After paying back every dime that they received from passing the law. Great commentary and should be well known that these legislators and governors have a vested interest in passing certain laws that benefit family or themselves ! Cyndi, in the case of Rick Scott and Florida, and drug testing, they don’t own “shares,” Rick Scott’s wife owns the company. He transferred interest in it to her BEFORE he signed this into law. Less than 2% failed the test.